Home / Region / Baton Rouge / LAFM TV 12th Season! Episode 19! LAFM TV 12th Season! Episode 19! Hey everyone! We have a great show lined up for you! In studio, we will have former LSU football player and current LSU Sports Radio Network Football sideline reporter Gordy Rush along with KTBS Sports Director Tatum Everett. Also, DiGulio Brothers Italian Cafe owner Mike Johnson and manager Clint Stockwell both talk about a great opportunity for our fans to win some prizes. Join host Lee Brecheen, grab the remote, and tune in to LAFM TV! Jace is from Addis, LA but resides in Port Allen, LA. Jace attends Southeastern Louisiana University and is majoring in Journalism. 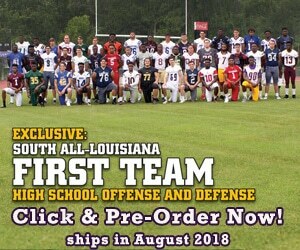 This is Jace's third year as Associate Editor at Louisiana Football Magazine. He is also a graduate from Catholic High School in Baton Rouge where he was the editor of the school newspaper the “Bearly Published.” While at CHS, Jace also announced their football, basketball, and baseball games for the Bruin Broadcast Network which is the Catholic High’s streaming website for their events. On weekends, Jace is the PA announcer for his middle school football games. At home, Jace enjoys time with his family and friends. Besides being a huge football fan, Jace is also an avid NHRA drag racing fan.